One Of Those Very Fun (and Sacred) Ceremonies I Live For – Marques & Christy Johnson! Okay, how much fun can I truly have with one couple? Picture this. A formal evening ceremony at the Washington Athletic Club, gorgeously designed by Wedding Planner Rebecca Grant. 150+ people. Large wedding party. Gorgeous Bride. Festive Groom. Did I mention lots of joy? This I know for sure. Incorporating fun and laughter into a wedding ceremony is a gentle dance. In this work that I do, this means being fully in the moment with a couple and having an easy mastery of the “room” – knowing the couple, their family/tribe and a gathering a “temperature” of guests. 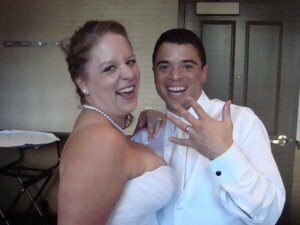 Marques and Christy – much much happiness to you! Comments Off on One Of Those Very Fun (and Sacred) Ceremonies I Live For – Marques & Christy Johnson!